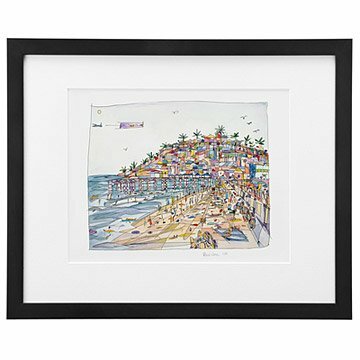 Renee Leone print captures majestic Pacific Beach in San Diego along with the fog-covered La Jolla hills. This locale was captured while the artist relished one of her favorite past times, simply sitting on the beach and painting. Here Renée captured majestic Pacific Beach in San Diego along with the fog-covered La Jolla hills. In a rare stroke of impulsivity, the artist's includes an abstract self-portrait within this summery piece. She sits front-and-center, her back to the viewer and her painting in progress on her lap. Renee Leone captured my favorite days spent on the beach perfectly! So much detail, beautiful colors and no part of the experience left out! I love it! I live just north of here and have always loved this view - and I love the artists perspective on it.